This vast contemporary villa is situated in an exquisite location at the peak of one of Koh Samui’s most exclusive gated communities. Curving around a high hill top in the Choeng Mon area the property offers spectacular views over the coast in all directions. This stylish modern home features 6 en suite bedrooms, a stunning pool and sundeck, a movie room, games room, 2 bars and plenty of spectacular open-plan living space. Spanning across more than 1600 square metres of private walled land, this super chic home is fringed with tropical gardens, charming terraces, private lawns and contemporary ornaments and art works. The property is entirely self-contained behind imposing iron gates, with 4 private car parking spaces, a lower level entrance, and a wide driveway which circles the perimeter of the home. The top floor features a huge open-plan living space, several relaxation areas and balconies, a modern fully-equipped western kitchen and large breakfast bar. These bright and spacious areas combine state-of-the-art amenities with uber modern design to spectacular effect. Slide away glass doors from each area open out on to a stunning dining terrace with seating for up to 12 guests. The outdoor area is adorned with landscaped gardens and a waterfall, an intimate outdoor bar and a floating staircase leading to the pool terrace. A large 24 metre infinity-edge pool is perfect for swimming laps or lazing the days away. The pool features a shallow end perfect for little ones and a deep end with a 2.5 metre diving depth. Surrounding the swimming pool are luxuriant day beds and umbrellas and an adjacent viewing platform complete with contemporary sofas and stylish fish ponds fish. The pool deck also features a bar and barbeque area, a bathroom with shower and access to the theatre room, games room with pool table and further garden areas all with stunning ocean views. The villa is home to two master bedroom suites and four more large double bedrooms, all with air-conditioning, roof-fans, stunning en suite bathrooms, private terraces and spectacular ocean views. Most bedrooms have fold out sofas as extra sleeping options for children. All bedrooms boast a bright and modern design, smooth terrazzo floors, stylish fixtures and fittings and luxuriant linens. This gorgeous home is located within an exclusive private estate with 24 hour security and a full on-site management service to attend to guests needs. The villa comes complete with three full-time staff, including maids, a live-in manageress and an optional chef service. There is also free use of the communal estate tennis court. The villa is located on the north-east corner of the island in the sought after area of Choeng Mon within walking distance of the beach, restaurants and bars. The airport is just a short drive away, as is the nightlife and busy tourist resort of Chaweng. The more upmarket Bophut Fisherman’s Village is nearby with its sophisticated restaurants, bars and shops. 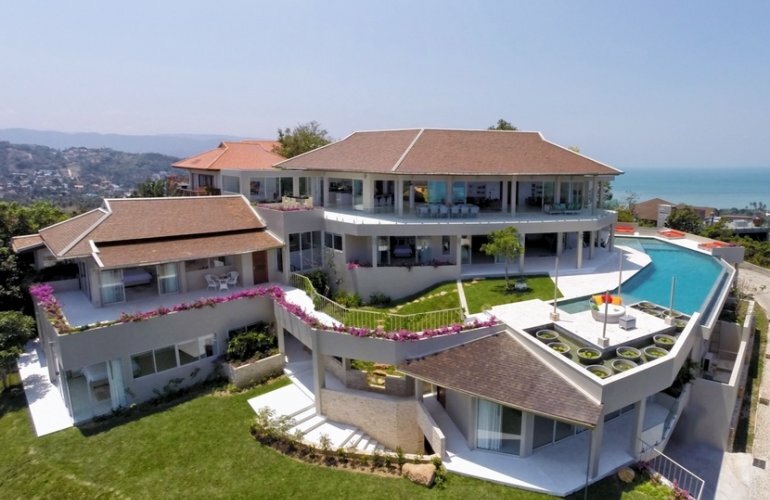 This stunning home is one of the most spectacular villas in Koh Samui, with an exquisite hill top location and breath-taking ocean views over Angthong Marine Park in the west, Koh Phangan to the north, Choeng Mon Bay to the east and the hills above Chaweng to the south. The villa enjoys both sunrise and sunset views with full height windows and clear glass balustrades providing unobstructed views from every angle. Relaxing in this gorgeous home with warm tropical winds wafting up from the Gulf of Thailand is a truly magical experience. Plasma TV, Satellite and DVD/CD player, iPod docks and Wi-Fi broadband internet.